BHG:Apple Cider in an Apple Mug This is an adorable idea from Better Homes and Gardens. Hallow out a large apple and fill it with your favorite apple cider recipe. Fun fall presentation! Design Sponge: Create simple festive food picks (above) this holiday season by altering this vintage garden marker idea from design sponge. I have some fun fall fabrics that would be so sweet! Cake Central: Holiday baking gets an inexpensive makeover with this simple trick. 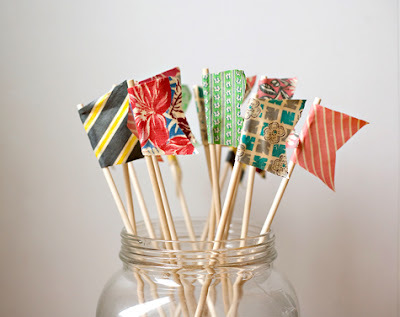 Turn dollar store doilies into chic cupcake wrappers.